This fabulous home was an architect’s dream, with one “outdoor’ exception, it had a lovely backyard, but with the smallest little deck with those awful builder steps to nowhere. 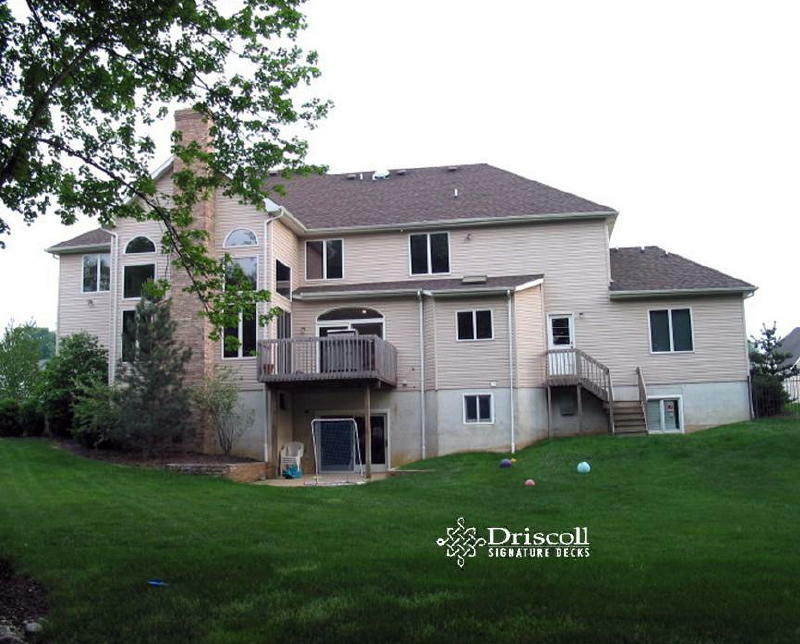 It looks as if the builder got to the ‘Outdoor Entertainment’ part of this beautiful custom home and said, “NO CAN DO!” – Driscoll Signature Decks to the rescue, once more! 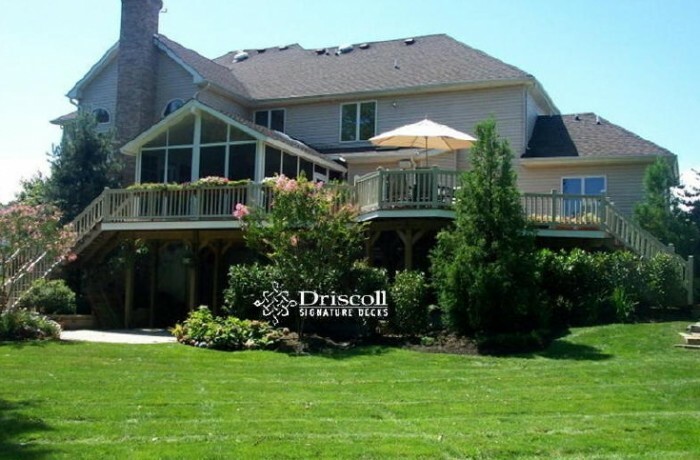 You will find quality deck designs, consultation and excellent craftsmanship when you search for Driscoll Signature Decks at Deck, Decks, Deck Builder, Deck Contractor, Decks NJ, Deck Builder NJ, Deck Contractor NJ, Monmouth County Decks, Decks Monmouth County NJ, Deck Monmouth County, Deck Monmouth County NJ Monmouth County Decks, Monmouth County NJ Decks Monmouth County Deck, Monmouth County NJ Deck, Deck Contractor, Monmouth County, Deck Contractor Monmouth County NJ, Monmouth County Deck Contractor, Deck Builder Monmouth County, Deck Builder Monmouth County NJ, Monmouth County Deck Builder, Monmouth County NJ Deck Builder, Monmouth County NJ Deck Contractor. As we were developing the deck plan, the question was asked, “So, does it get buggy here in the late afternoon and evenings?” “It gets buggy all the time..” was their reply. 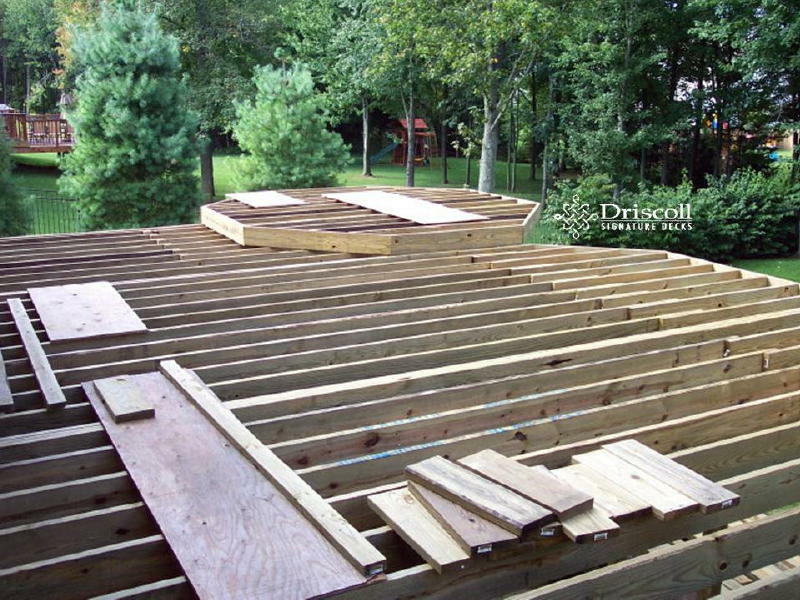 But, the always helpful Driscoll designers had an idea, how about we make this deck the right size so there will be enough room for a sunroom (aka screened in porch) and plenty of room for dinning alfresco on a separate step-up octagon. Sounds like a plan. Let’s get to it. We show this image as another example of Driscoll’s Signature Decks consistantly robust framing. 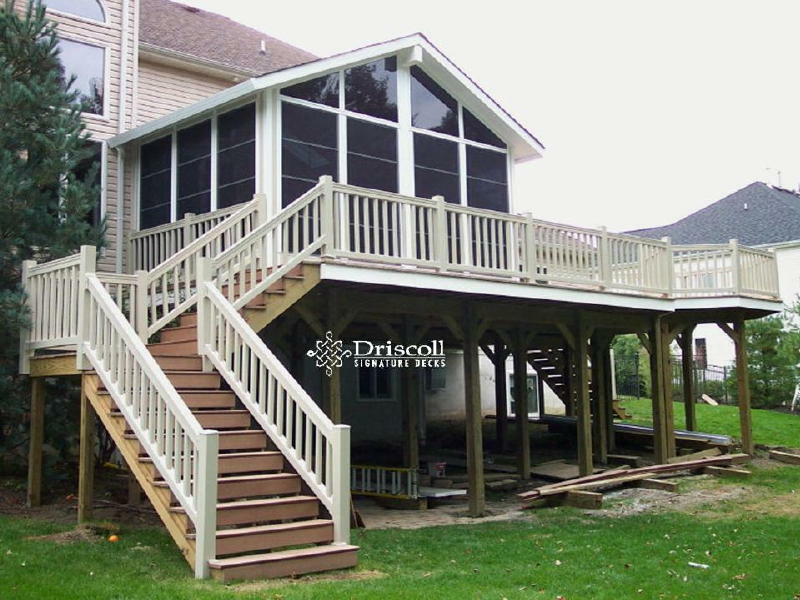 As you can see, this custom deck design has a separate 12′ step-up octagon for the dinning area (which looks like it’s just ‘floating’ out there 10′ above the yard. And, here is the first look at the how to enjoy outdoor living space, inside the beautiful sunroom – WITHOUT the bugs! 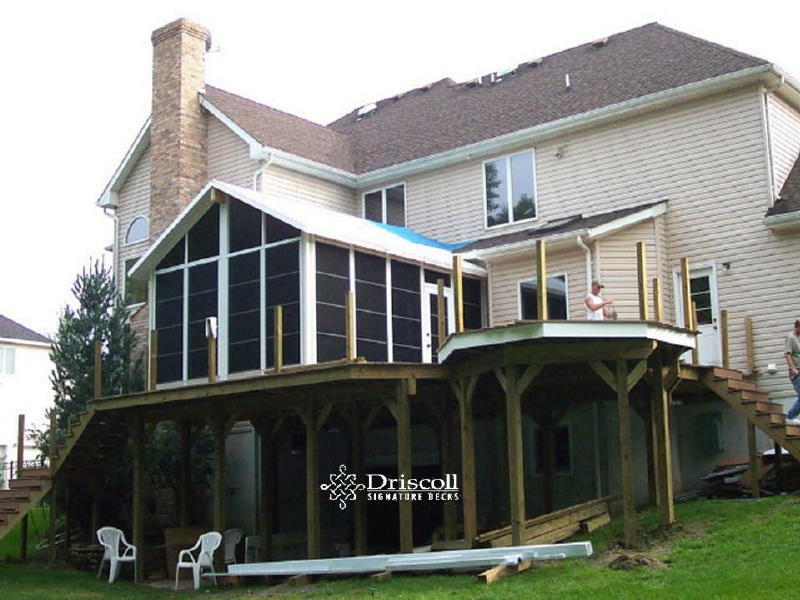 This sunroom or screened-in porch is 18′ across by 16′ down (or away from houseline) w/a 12′ cathedral ceiling, which as you can see, is sitting on top of a 10’6″ TOD deck height – an elevating project to build – for sure..! We’re almost finished these platform stairs to the yard below; and if you look through under the deck, you can see the underneath section of the other stairs we built down to the driveway and garage. You may not be able to see it very well from this angel, but the roof of the sunroom is shingled and wait until you see the inside – in one more image down (v). 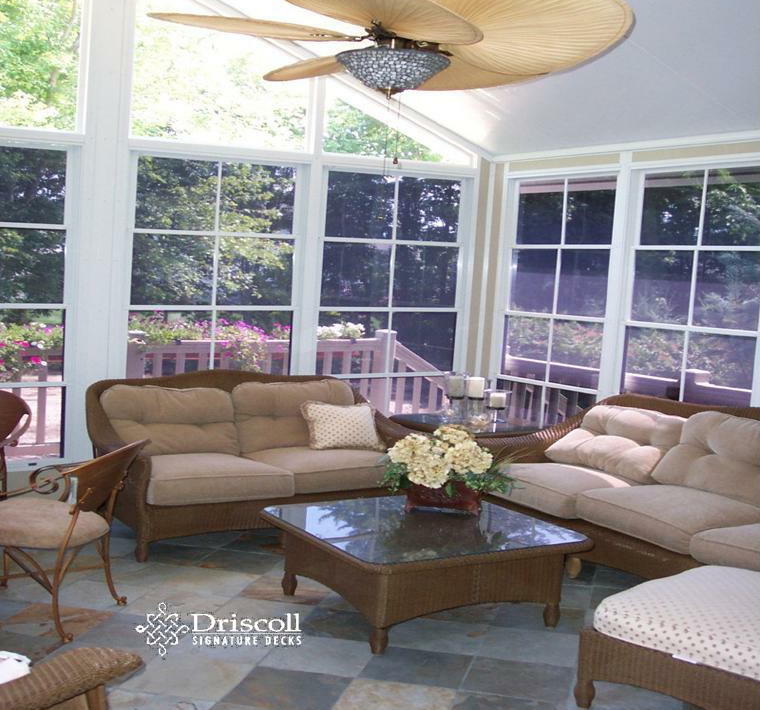 This is a classic Driscoll Signature Sunroom design. 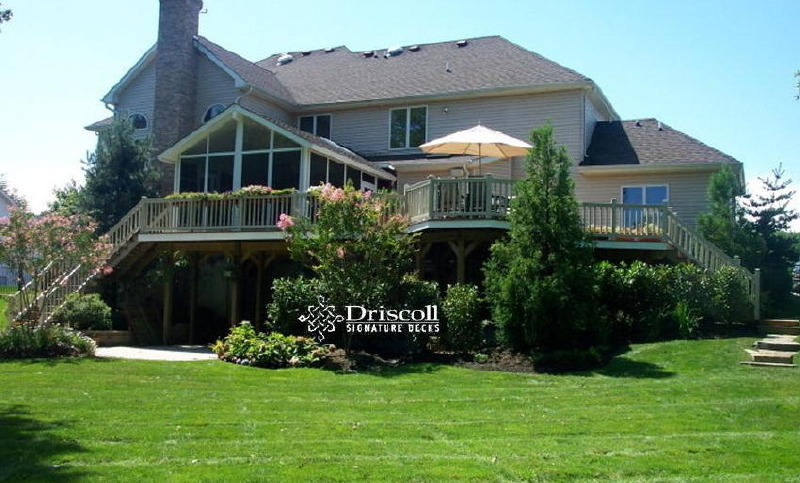 This exact image of this finished Driscoll sunroom was highlighted in a national outdoor entertainment design magazine AND Driscoll Decks also won an award from the sunroom manufacturer for it Best New Design!